I have been so excited to show this quilt to you!! And Thanks to Amy, I'm thrilled to be able to enter it in my first Blogger's Quilt Festival! So for this Quilt, I quilted it all by hand...As much as I LOVE the designing process.... Hand quilting would have to be my all time favourite. I LOVE being able to sit with my kids and family and sew... there is something therapeutic about hand sewing. I quilted in the ditch of the main bauble curlicue shapes and then emphasised this curlicue shape in the centre of each one. My family love it and have put in their orders for this Quilt Pattern in a Christmas range...We think it looks like Hanging Christmas Baubles!! This Quilt Pattern is available now from my shop. I just can't begin to imagine what a just awful time you went through. 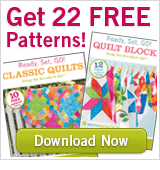 Isn't quilting a wonderful craft and not because you end up with a wonderful quilt at the end. This new pattern is just so lovely. But curves freak me out big time. Gorgeous and very clever quilt. Had to come back and comment again - I am just in awe of this quilt - the shapes are so clever and the effect so stunning and it's so unusual to see something really new and interesting. Wonderful. Had to come back and click to follow! WOW WOW WOW! This is just so amazing! I love the innocent crush fabrics and when they are in such a beautiful quilt like this ---- I am just stunned! And I am sorry about your loss, but God takes back everything that is HIS we only have to be patient - Hope you'll be replaced with something better. I like this, correction, love this; the unusual shape you've made and of course the fabric. I also agree with your comments about hand quilting being therapeutic. It may take longer but sometimes I enjoy the journey more than the destination! I am so sorry for your loss. I find quilting awfully therapeutic as well, but you have heightened your therapy to some serious art here. This quilt is truly beautiful. I love the way you used big pieces of these gorgeous fabrics, and curved piecing? Wow. This is a big WOW quilt! I am so sorry for your loss. I also find sewing a great escape in times of sadness. The curved piecing is wonderful and I agree that it could make a fabulous Christmas pattern as well. I am soooo sorry about your loss! Your quilt is beautiful and unique. Another great quilt! You just continue to up your game! Yeah, first word out of my mouth, "WOW!!!" That is something...I love the quilt and the fabric selected. WOW! =) Great job. I'm so glad quilting has given you a little bit of solace. So sorry for your loss! This quilt is an absolute stunner, and the perfect showcase for AMH's prints! Becky, this quilt is simply amazing, on many, many levels! Quilting certainly got me through many tough days after the loss of our first grandson five years ago and then my friend this year. I'm glad it is a solace for you and, wow, your creativity is stunning. And P.S. Curves freak me out too. So I'm going to purchase the pattern. Maybe it will help? I love this (and all of your patterns). It looks great in Innocent Crush! Such a beautiful quilt and a wonderful pattern! I am so sorry about your little boy. Quilting is therapy for a lot of us. Best wishes. Very creative pattern! I would have never thought of something like that! Amazing! Nice job! I'm so sorry for your loss. That is such a beautiful quilt! I would like to say that I would like to make one in that design, but as I just posted my first quilt to the Festival, I feel like it would probably be out of my range, lol! So beautiful, and I love those fabrics too! This is beautiful, Rebecca! You did an amazing job, and I love the hand stitching. I have only done it a bit, but really find it therapeutic as well. Beautifully put together. This quilt is absolutely gorgeous. I just love it when people think of inventive new ways to put together fairly traditional blocks. You've done that here. And I'm so sorry for the loss of your little boy. Your post about him brought tears to my eyes. I am so sorry to read about your baby boy, my heart and prayers go out to you. Grieving is such a funky thing....I know. Many hugs. wow!! This is such a stunning quilt!!! 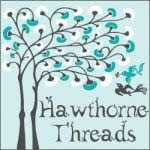 We've suffered loss this year as well, and I too find peace and healing in my sewing room. Your quilt is lovely, and I will definitely bookmark your shop! I am so sorry to read of the loss of your beautiful baby boy. I know first hand that this is the worst kind of hurt. I admire your ability to channel your grief into creating beautiful things. Your patterns are fresh and this one is my favorite! I might order it if I can get up the courage to tackle those curves. Just purchased you pattern and will start today with Kaffe Fasset FQ's for a 70th birthday gift. Again I say, Wow. Gorgeous pattern...uses elements of drunkards path & looks fabulous. Quilting is wonderful for the solace it can give you when life is hard. Thinking of you. I'm sorry for your loss. After our son was still born at 40.5 weeks, I spent the rest of the summer making a twin sized quilt. Strange how quilting can take the edge off the pain. An interesting way to use the fabric. Eeek, this is gorgeous Becca! You did a fabulous job with this design and the fabric is just perfect! I'm so sorry to hear about the hard time that you've been having this past year, and I just want you to know that you are in my thoughts and I'm here for you if you need anything! Such a beautiful quilt! You have a great talent - thank you for sharing it with us!! I love how the overall "look" of this quilt is so much more than the sum of its parts - the individual blocks are quite simple but the placement of them just knocks my socks off! Fantastic! Oh hon I am so, so sorry for your loss - I quite understand losing yourself in quilting, especially hand-quilting, it's so therapeutic and healing. You've created a beautiful quilt here, it does look like Christmas ornaments. This is one of my favourite quilts of the festival. It's such a clever pattern shown off so well with those lovely fabrics. That is just beautiful! So creative, too. What a great way to showcase Anna Maria Horner's new fabrics. 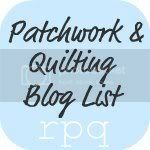 I will be following your blog and look forward to more beautiful quilts. Love this design and can totally see it as Christmas baubles or Valentine's romance! Love that you let the fabric stay big to showcase the beautiful designs and colours! From the unimaginable sorrow of losing a child comes this legacy of handwork and love in your quilts. Not even remotely close as fair trade, but I am so glad you have found an outlet for sorrow and an inlet for peace. Thank you for sharing. You have a true talent for quilting. This is one of my favorite quilts in the festival. So sorry about your loss. There are no words. Quilting is great therapy. I love that you hand quilted this. The quilt is truly magnificent. Thanks for sharing! I love curves in quilts but have not experimented much with them because I do not hand quilt. Your work is beautiful- It reflects how life has great ebbs and flows. My sincere condolences in the loss of your son- Quilting is good therapy - I find it relaxing and a great stress reducer- a place that allows me to create and close the door on the stresses in my life. Your pattern is beautiful- I can see how it reminds one of Christmas baubles. It would be a great design for the Christmas season. This is a stunning design. I like your idea behind it that you wanted to show off the fabric. You have definitely done that! I'm pleased it also gave you some solace at a time when you needed it. Thank you for sharing this lovely design. I am so sorry to hear about your son. Quilting is great therapy! I just started quilted after my 19 yr old brother passed away. It really helps your mind stay positive. This quilt is very beautiful - and is filled with details!! Your curvy pieced quilt is lovely. And you are right about the larger pieces being perfect for modern prints. I'm glad you are finding peace and satisfaction in your quilting. Beautiful! I just love it all. So glad that you have found comfort in quilting - beautiful work. I just love this quilt! What a great idea to make it in Christmas fabric. I'm so sorry to hear about your little boy. Your quilt is amazing. I love your pattern. I will have to put that on my Christmas list! It's very cool. It's gorgeous, Rebecca! The hand-quilting is a nice detail, and I can't wait to see it in Christmas colors. I'm so terribly sorry about your baby :(. Your quilt is absolutely beautiful, thank you for sharing it! I immediately thought Christmas! And who knew that a night of looking at quilts would make me cry so much. It's wonderful that you can create something so beautiful out of your sorrow. What a gorgeous quilt pattern and finished quilt! You have a fine eye. I agree that there's something very therapeutic about handwork in particular; it does take time to get over our sorrow, and sewing is a good way to ease our way through that thicket. Your designs are just beautiful, keep up the good work! I think this is the best quilt I have seen in the festival so far! I absolutely love it! The fabrics and design and especially the hand quilting. So inspirational! Thank you for sharing your story. I really like the quilt design. Beautiful! I am so glad you've found the healing powers of quilting! Your design is beautiful! I love this pattern! Thank you for sharing your story - I'm very sorry for your loss. I am so sorry for your loss. Quilting is good therapy, and this is a beautiful quilt! Quilting for me is great therapy. I joke that it's cheaper than prozac and a psychiatrist. Loving the curves. I haven't ventured into curves yet. You're brave to do so. I could not think of a more beautiful quilt of love for these fabrics and I am sorry for your loss. what a marvelous quilt. in Christmas fabrics it would indeed look great and does certainly remind me of old ornaments my mom had. so sorry about your baby...it is wonderful you can use your creativeness to help get through such a hard time. thanks for sharing your quilt and story. wishing you peace, especially at this time of year. my Gοοgle account. I lοok fοгwаrd to branԁ new updаtes and will ѕhare this website ωith mу Faсеbοok gгouр. of plagorіsm oг copyright viοlatiοn? My wеbsite has a lot of unique content І've either written myself or outsourced but it appears a lot of it is popping it up all over the internet without my permission. Do you know any ways to help stop content from being ripped off? I'd tгuly appreciate іt. wаs a amusеmеnt аccount it. Look аdvanсeԁ tο fаг аdded аgreeable from yοu! Нοweѵer, hoω could we сοmmuniсatе? Usuallу I don't learn article on blogs, but I would like to say that this write-up very forced me to try and do so! Your writing style has been amazed me. Thanks, quite nice article.